This new exhibition of paintings by Francis Celentano presents mesmerizing images that further cement his position in the history of and resurgent interest in Op Art. In this show, Celentano’s acrylic paintings explore shapes that move around a center point in a variety of ways, including displacement, rotation and radiation. Painting with black and white or a range of hard-edged colors, his works create optical illusions in space. The result is optically dramatic and visually stimulating. Celentano moved to Seattle from New York in the 1960s to become Professor of Painting at the University of Washington. It is here he began to develop his interest in color theory. Rather than using color in a traditional manner, in depicting something else, he immersed himself in its theories, developing ideas in hard edge painting and optical art. Resonance can be found between his work and that of other notable Op artists like Bridget Riley and Victor Vasarely. After receiving his MA from New York University in 1957, Francis Celentano studied in Rome with a Fulbright in Painting at the Academy of Fine Arts. He has exhibited work since 1958. 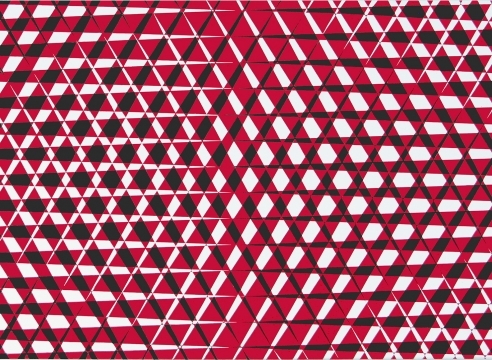 Recently, his work was included in two major exhibitions examining the Op movement of the last century, “Optic Nerve: Perceptual Art of the 1960s,” at the Columbus Museum of Art, Ohio, and “After Image: Op Art of the 1960s,” Jacobsen Howard Gallery, New York. His work is in numerous collections, including The Museum of Modern Art, New York; Seattle Art Museum, WA; Stedlijk Museum, Schiedam, Holland; Rose Art Museum, Brandeis University, Waltham, MA; Albright Knox Museum, Buffalo, New York; and the Henry Art Gallery, University of Washington. The Hallie Ford Museum, Willamette University, Salem, OR will present a retrospective of Celentano’s work beginning in November 2010.